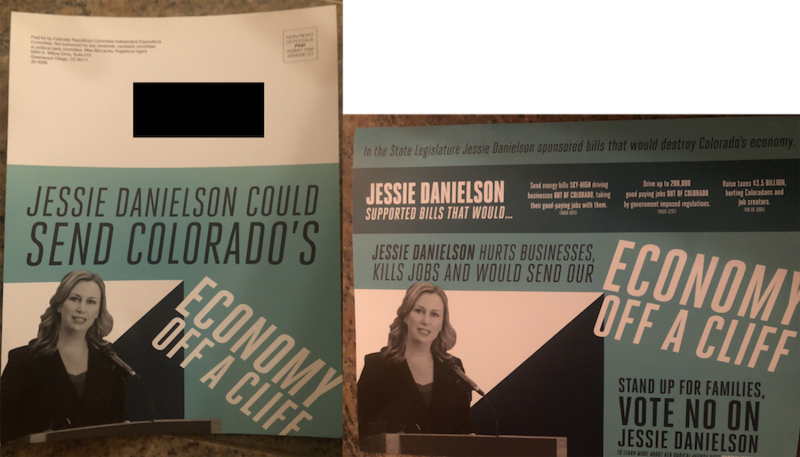 This mailer from the Colorado Republican Party super PAC says Democratic state Rep. Jessie Danielson will send "the economy off the cliff" if she's elected to the state Senate, where she faces Republican Christine Jensen in November. A measure Danielson supported to balance oil and gas development with public health concerns. A bill aimed at preparing for the impacts of climate change by reducing greenhouse gas emissions. Her vote for a measure to improve family leave by charging an insurance premium of less than 1 percent of wages for all employees in Colorado. Because the program would have been considered an enterprise under state law, it wouldn't have qualified as a tax; higher taxes requirevoter approval. The $3.5 billion number appears to be the maximum amount the measure would have raised over a few years. All three bills died in the Senate. The Colorado Republican Party's independent expenditure committee takes unlimited contributions and may spend unlimited amounts. But the committee isn't supposed to coordinate with candidates. Big donors include Anschutz Corp. at $300,000, Pete Coors at $250,000, J. Martin Landis at $150,000, and Extraction Oil & Gas and DCP Operating Co. at $100,000 each. The Republican Attorneys General Association gave $215,000.